Recently, I told you guys about how I was doing the Slow Carb Challenge. It’s still really great. I’m on week 5 of my 6 week challenge. I’ve also recently spoke of how important snacks were to me and how I need to make time to prepare for my snacks. It’s of vital importance to my health and weight. Today, I wanted to share another snack with you guys! Baked Zucchini & Squash Chips. 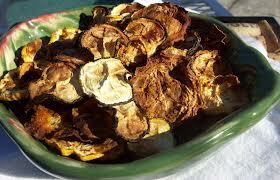 If you google images of Zucchini & Squash Chips you will come up with a lot more pretty pictures of them. Mine never seem that pretty. But they taste wonderful!!! Slice the Zucchini and Squash up really thin. Throw them in a gallon sized zip-lock baggie and drizzle them with just a bit of Extra Virgin Olive Oil and salt. Zip up the baggie and shake it all around really well. You want the EVOO to be a coating over each veggie slice. Lay them out thin on parchment or foil lined baking sheets. Sprinkle on some minced garlic, garlic powder or parmesan cheese at this time if you so prefer. Bake them in the oven at 200 Degrees for 2-3 hours (depending on how thin they are).